Ever Wondered How Animal Human Communication Works: Or if Communication Between animals is Possible? Animals are by nature telepathic, meaning they can hear each other’s thoughts. They are very connected with each other and other species, and are in tune at a deep, energetic consciousness level. The good news is that we humans are also born knowing how to communicate through energy, heart to heart, mind to mind. Most of us have simply forgotten how to do this consciously, although all of us continue to do it subconsciously. Val considers this to be our First Language, the one we are all born knowing because we are all connected together. Babies know each other and communicate through energy. Have you forgotten how to communicate heart to heart, mind to mind? That’s ok, because Val can help you. You can learn how to communicate with your own animals if you want to re-remember and spend the time necessary to open this remarkable Gift back up, develop your own skills and deepen your innate abilities. Animal human communication is a priceless gift, and one your animal friends want to share with you. Our animals have learned that they have to be very basic in their communication with us. They also have to use more physical signals and body language because most of us simply can’t hear them telepathically. What About Telepathy: Empathic communication is simply connecting with the soul or spirit of another being, their essence, thoughts, values, perceptions, and other mental, emotional and spiritual qualities. All animals communicate empathically. This isn’t something to fear but to simply accept. It is the inborn quality of all beings, including humans. Most people in our culture are socially conditioned from childhood to deny empathic communication so we tend to block our abilities. Humans who are sensitive, receptive and attentive can recover, develop and increase their innate ability to mentally communicate with each other and other species. This isn’t about using your psychic powers trying to predict the future or to find out about some long lost lover. And it isn’t about prying into confidential matters. Val’s work is no different than having a heart-to-heart discussion with another loved one, where both really listen to each other. While she can usually perceive a lot about an animal and their caregivers, she doesn’t necessarily know details about their lives or feelings unless she has permission to ask directly. Nor does she pry into the mind. That would be an invasion of privacy — to both the animal and the person. She operates under a high Code of Ethics, focusing on the issues she is asked to address, and is always respectful if the answer is an unwillingness to go there. Through counseling skills, she is able to gain insightful and useful information, always respecting the individual’s rights and boundaries. Consultations are as confidential as going to a therapist, doctor or psychologist. Or if you prefer and your animal agrees, other people can observe and listen in to your session as long as that is comfortable for you and your animal friends. What they tell us will help determine how best to spend your time, energy and money to achieve the best results possible. Remember that our animals (and children!) are greatly affected by us, their caregivers. What we do, say, think, decide and feel can rock their world — or anchor it. The better balanced we are, the less stressed they are. So what may seem to be a problem with them may actually be an issue stemming from their humans or family networks. 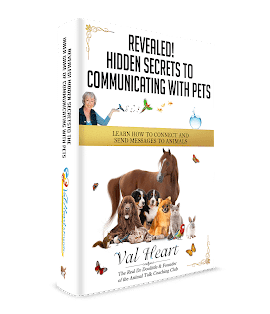 How Val Differs From Other Animal Communicators: She specializes in “what’s next” which many animal communicators do not (sometimes they only tell you what you already know!). And depending on what’s needed, she can also do energetic healing, counseling, negotiating or identify what other modalities are needed. She has always felt that talking with our animal companions is the first step, but that what’s really needed and wanted (by you and your animal!) is how to best resolve the problem, whatever it is. So depending on what your animal(s) has to tell you, she will be able to help you make progress. Are You Ready to Schedule a Personal Consultation with Val to Help You Resolve Problems With Your Animals? CONTACT VAL NOW TO SCHEDULE YOUR APPOINTMENT TODAY! Remember: For every problem you have with your animals, Val suggests talking with them FIRST to learn ‘from the horse’s mouth’ what they think the problem is, how they’re feeling or what they are experiencing, what they need or want, what’s helping and what’s not helping. If you don’t, you can go way off track very quickly without ever truly knowing what the real issue is – from their point of view. You might get lucky and things get better… Or you might just make things much worse and have little to show for all your time, energy and money.